Proper ventilation is essential to any home. However, conflicting opinions on which of the many types of roof vent is most efficient may be quite confusing. Depending upon your local climate, building codes, and the size of your home, one type of vent system may be more efficient than another. There are two major types of vent systems, intake and exhaust, and you should consider adding one of each for maximum efficiency. 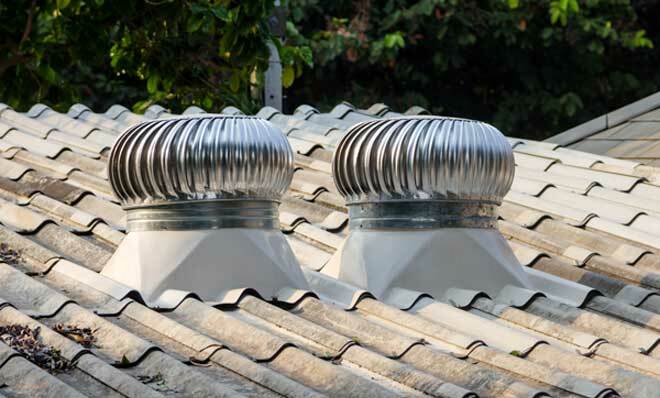 The primary purpose of an exhaust vent is to pull excess heat and humidity from your home. However, it is a common myth that these vents also remove heat in winter months. Properly installed roof vents will increase the lifespan of your roof by reducing the risk of warping or other water-related issues. Exhaust vents should always be paired with an intake vent system for maximum efficiency. More often a decorative feature, cupolas may be converted into functional static vents. They are located atop ridges which allow them to draw heat and moisture efficiently where they are located. Unfortunately, this type of vent is a poor choice on its own due to its limited coverage and is therefore best used to compliment other exhaust systems. Also known as box, turtle, and low-profile vents, this system consists of static louvers which must be spaced evenly and as close to the ridge as possible for maximum efficiency. Some models are square while others are rounded, allowing for some limited aesthetic choice. They sit lower than roof turbines, making them less visible, although they are still easy to spot. You will find these to be an excellent DIY project as they are easy to install, especially if your home has an existing static vent system. Some additional steps and care are needed to make these systems waterproof. In addition, they are less efficient than ridge vents and their visibility may make them an unattractive choice for your home. Finally, while inexpensive, the cost of installation may increase depending upon how many you need and how good your intake system is. Generally consisting of electric fans built into the gables of your attic, powered vents are a mix of good and bad. For example, they require 300 watts of electricity to run, which has an environmental impact. At the same time, they are usually paired with a thermostat so they only run when the attic temperature exceeds 100 degrees. Newer solar models allow powered vents to run off the grid, but are more expensive. A powered vent is often noisy, with the sound buffered only by your home’s building materials and insulation. You may hear them running late into the evening in warmer climates when you are trying to sleep. Installation is more difficult and may require electrical knowledge if adequate power supplies aren’t readily available. The added weight also makes them more difficult to install. Finally, there are many moving parts which make this type of ventilation more prone to breakdowns. Frequent inspections are therefore necessary to ensure the fan is functioning properly. Ridge Vents are installed on the peak or ridge of your roof and covered by shingles. They contain no moving parts but must be properly paired with intake vents, such as soffit vents, in order to function. Unlike other types of vents, the ridge vent doesn’t create hot or cold areas in your roof, preventing some parts from aging faster than others. You should not attempt to install a ridge vent as a DIY project, as they are extremely difficult to install and the vent itself is expensive. Some contractors will attempt to run the vent only partway along the roof, which lowers or even negates its functionality. Another common problem is that the exhaust hole must be equal in size to the intake holes for the vent to function properly. As a result of these difficulties, ridge vents may not be right for your home, even though they are overall the most efficient option. Made of lightweight aluminum, roof turbines resemble mushrooms with fan blades protruding from their sides. These blades may either be housed in a protective casing or have small louvers designed to open only when there is wind. They are highly effective and require no power. Stale, moist air slowly escapes from the turbine and a gentle breeze causes the turbine to pull large volumes of air up. Because they require no electricity to function and are made of aluminum, roof turbines have little to no carbon footprint. Many models make no sound when turning, and this motion also keeps water from seeping in. They are also easy to install, making it a DIY-friendly project. There are a few disadvantages to this type of ventilation system, however. Roof turbines are popular on commercial buildings, although you may find them less attractive unless you have a flat roof. They also work more efficiently when paired with low wall or soffit vents. Cheaper models which do not have a sealed ball bearing system may squeak when the wind turns them. This also happens with some older models that have rusted. There is an old saying that nature abhors a vacuum. This is no different for your attic or crawl space. Installing an exhaust ventilation system without an intake system to compliment it will generally render your vents useless. By having a combination of intake and exhaust vents, air will circulate more freely and you will gain the maximum efficiency for your system. There are two popular intake vent systems to choose from. These triangular vents are located along the peak of your gables. While visible, they are not unattractive and may be screened over to prevent insects. Unfortunately, they have limited coverage and are less efficient on their own than soffit vents unless your roof has a multi-gable structure. Best used in conjunction with ridge vents, a soffit vent is named for the part of your roof into which it is installed. A soffit vent is generally made of PVC or aluminum and may be used in conjunction with existing intake vents for more efficiency. The vent itself is only visible when looking up at the eaves, making them difficult to spot. This downwards-facing orientation also allows air flow while preventing moisture from getting in. Soffit vents may be continuous or in square or rectangular panels, adding to their versatility. The following chart compares various types of vents for easy reference. Note that due to the wide variety of roof configurations, building materials, and models available, average costs are not given in monetary amounts. You may also find your personal experience varies due to these same factors. Fine Home Building offers an in-depth article on the basics of roof venting, how it works, and problems associated with an incorrectly installed vent system.